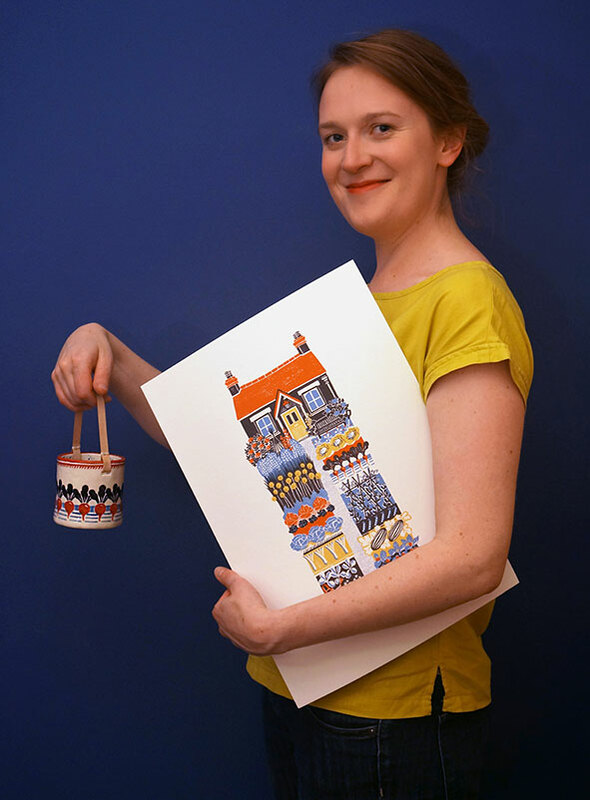 Hello, my name's Sophie Elm and I'm an illustrator, surface pattern designer and ceramicist, working under the alias of Jeff Josephine Designs. Using my background in Illustration, I draw (pun intended!) on these skills to design and create a hand crafted collection of illustrative studio pottery, art prints and printed textiles. All with a strong bold colour palette and playful yet elegant use of pattern, giving a fresh look to a range of handcrafted products for the home. I love to play with the contrast found between soft botanical forms and bold geometric shapes and this juxtaposition is prevalent throughout all of my work. I also undertake a wide variety of commissioned work, both commercial and for private clients. Please see the website for more details. All pieces are made from my home studio in Gloucestershire. I try to source all my materials as locally as possible or within the U.K. Digitally printed textiles are printed in Kent and my giclee prints are printed in the Cotswolds. My work has recently been featured in Country Living and Period Living Magazine.